Celeb Gossip News – Venezuela Was Crumbling. A Blackout Tipped Parts of It Into Anarchy. MARACAIBO, Venezuela — The city was collapsing long before the lights went out. But then came the blackout — and with it, anarchy. For days and nights, unruly crowds sacked 523 stores in Maracaibo as residents stood on their porches wielding weapons to guard against looters. Dozens died in hospitals. Bodies decomposed in the morgue. And what little food remained in refrigerators rotted away as the nation went hungry. 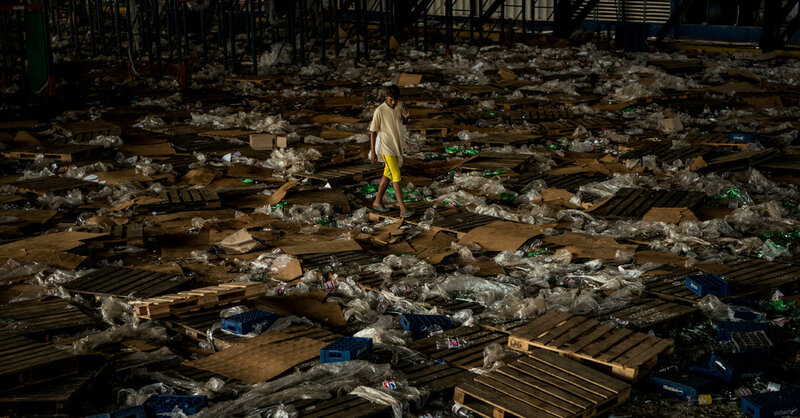 I drove to Maracaibo with a photographer for The New York Times to witness the chaos wrought by a devastating blackout — likely the largest ever in a country already crumbling from an economic crisis and a shortage of food, medicine and water. Along the way, smoke hovered over the road as business owners burned the trash left behind by looters. At night, only the car’s headlights pierced the darkness, outlining the silhouettes of pedestrians. The entire nation was plunged into darkness for six days straight. But here in Maracaibo, a sweltering coastal city, the nightmare continued beyond a week: Desperate people searched for food in stores laid bare or shuttered, and formed long lines in front of the few bakeries brave enough to open. Many businesses were reduced to shattered glass and smoldering piles. Everto León, 58, sat on a pitch-black road where the power outage continued, a short drive from the worst of the looting. His silhouette, barely visible in night, showed the bulging tumors under his jaw from the cancer that was killing him. “I don’t have the medicine I need, and the chance of getting it is now nill,” said Mr. León, saying the rioters had sacked every pharmacy around him. The power failure has become the latest battleground in a country where two men now claim to be president. Juan Guaidó, the opposition head who is recognized by more than 50 countries as Venezuela’s legitimate leader, has offered it as evidence that the state is failing. President Nicolás Maduro has blamed the United States, which it says worked with the opposition to sabotage the electrical grid — putting Mr. Guaidó under investigation, and sending intelligence agents to detain a well-known journalist for an alleged role. The spectacular power failure was most likely result of a simple brush fire that destabilized the country’s electrical grid, union leaders said. It underscored the lack of maintenance of key infrastructure and the years of mismanagement of the country’s economy, which have become the twin hallmarks of the nation’s economic collapse. And it laid bare Venezuela’s grim reality: When there is no power, there is no rule of law. It began so much like Venezuela’s many other outages that few even took note at first. Maracaibo sits in Venezuela’s most populous state and was the first to receive electricity generations ago. But today it lies on the far western edge of the electric grid, a sweltering Caribbean city whose high energy consumption has left the power flickering on and off for the last three years. When the lights went out, around 1 p.m. on a Thursday, David Ardila, a publicist, tried to go about his work as usual. “We thought it was normal electricity rationing,” he said. The rolling blackouts usually ended before nightfall, Mr. Ardila knew. But then he got a call from his wife. This was no normal power outage. It was not confined to their neighborhood, she said. The entire country — all of its 30 million people — was now without power. Nevertheless, the problems seemed manageable. When cellphones began to power down on Friday, a neighbor fired up a generator and let others recharge. But food, always in scarce supply in Venezuela, was becoming a concern in the neighborhood. On Saturday, many began to realize any meat they had in their refrigerators would soon be rotting. Using stoves still connected to the gas supply, some residents cooked the meat, while others tried salting and drying it. As the day wore on, people began to rush the few gas stations that remained open as lines of hundreds of cars snaked around blocks in the sun. A protest called by the opposition was put down violently by police. Mr. Maduro, silent until the weekend, appeared on television but said little about how the government planned to address the issue. The first gunshots sounded on Monday outside Omar Chávez’s neighborhood. Mr. Chávez had just returned from looking for medicine for his daughter and stocking up on dollars when he heard the beginning of a riot. He got to a safe place and kept watch. A group of more than a thousand people had descended on a nearby business district, breaking glass windows and raiding merchandise, according to merchants. Venezuela’s national guard, plagued by months of desertions, was nowhere to be seen. “In the middle of this blackout there was no authority,” said Miguel Sierra, who was selling laundry detergent when the looters arrived. As night fell, the crowd started setting stores alight. “I think they started the fire because the lights were out — there was no other way to see what there was to take,” said Marbella Jiménez, who runs an informal stall. As the riots continued, hospitals braced for the injured, who soon showed up with gunshot wounds or injuries from broken glass. But the hospitals, which barely had soap because of the shortages, now also had no electricity. A top medical official, speaking on condition of anonymity for fear of government reprisals, said 47 people died in Maracaibo’s main medical center. “At least half could be attributed to the crisis,” the official said, citing patients who died of heart failure or complications from untreated diabetes. The medical officials also said several young men who arrived with gunshot wounds received amputations rather than less severe treatments that could have resulted in fatal complications if the blackout continued. In one hospital, powered only by a generator that lit up the emergency room, an armed group entered unseen and robbed patients on two floors, according to doctors. The maternity ward in another hospital had no windows, and pregnant women had to be relocated to an outdoor plaza, doctors said. This week, Mr. Maduro explained what his government had determined to be the cause of the power outage: a “cyber electromagnetic attack,” organized by the American government out of Houston and Chicago. The explanation left Ms. Figueroa and many others unconvinced on the eighth day of the outage in her neighborhood. But then a miracle caught her attention: The lights at last flickered back on. A cheer erupted as street lamps lit the faces of the neighbors who had been sitting around on a dark lawn. But no one knew how long the electricity would stay or when it would be gone again. “It’s something new, the great leveler that we all live through equally,” Ms. Figueroa said.